Asparagus is a vegetable that I grew to like during my years in America – we never cooked with it in Russia. Up until recently, I prepared it the conventional way – steamed or grilled. Every time while cutting off tough ends of the spear, I would chop off a little piece for myself to enjoy its crunchy and fresh flavour. It always tasted better than cooked and the thought of serving raw asparagus often crossed my mind. 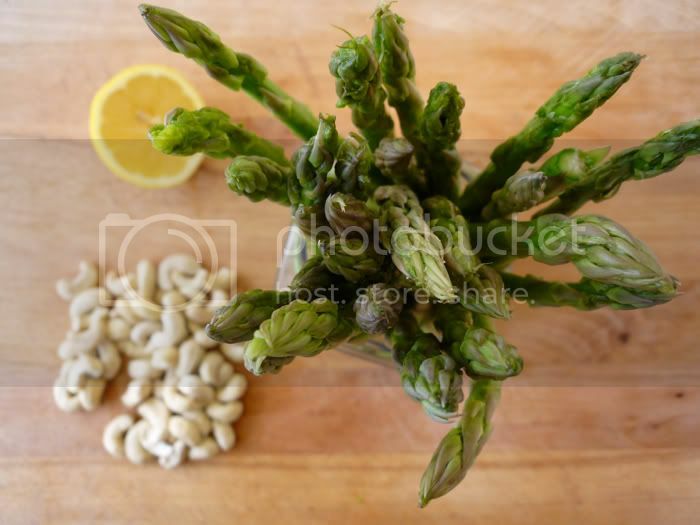 Asparagus is a wonderful spring vegetable and is especially rich in vitamin K and folic acid, as well as a whole spectrum of other vitamins and minerals. 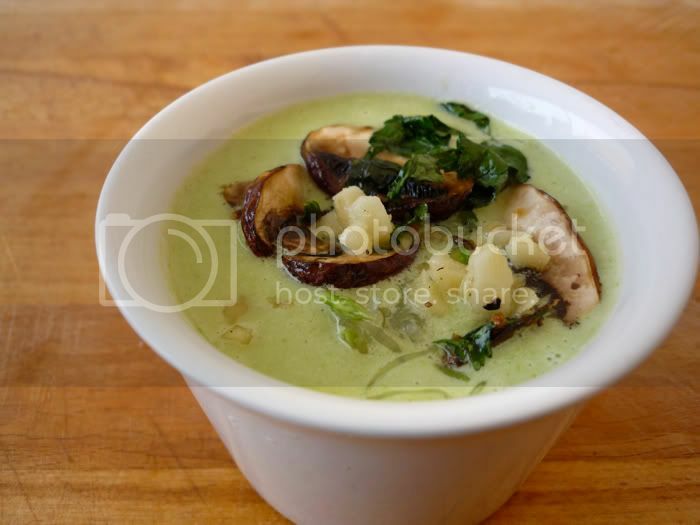 This soup is as easy in preparation, as it is impressive in taste and presentation. I like to serve it at small gatherings, when other dishes are much more involved. It’s also a sure way to impress skeptical eaters. I never announce that dishes are raw prior to my guests tasting them. Instead, I wait for their pleased faces and then surprise them with the news. The recipe is adapted from Awesome to be Rawsome. 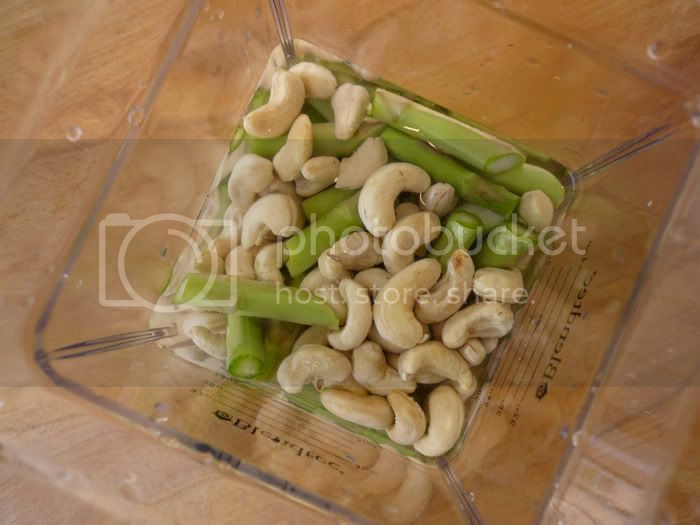 Soak the cashews in purified water for about an hour. Cut or break off tough ends of asparagus and discard them. 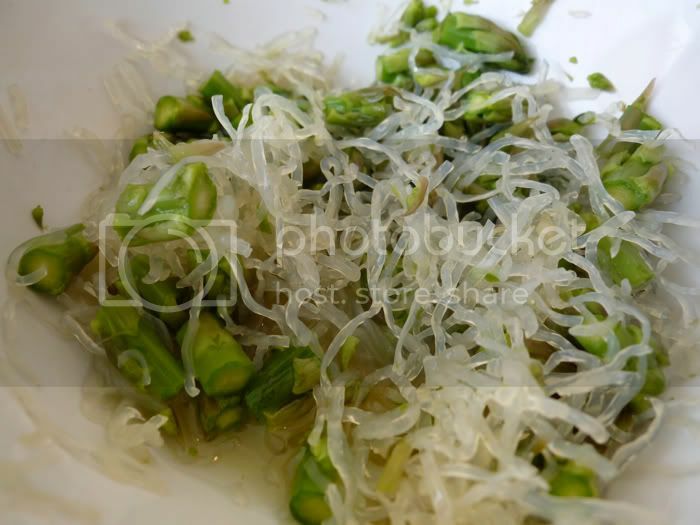 Cut off the tender tips of the spears and combine with kelp noodles (if using), squeezing the lemon juice over them to marinate for a bit, while you make the soup. 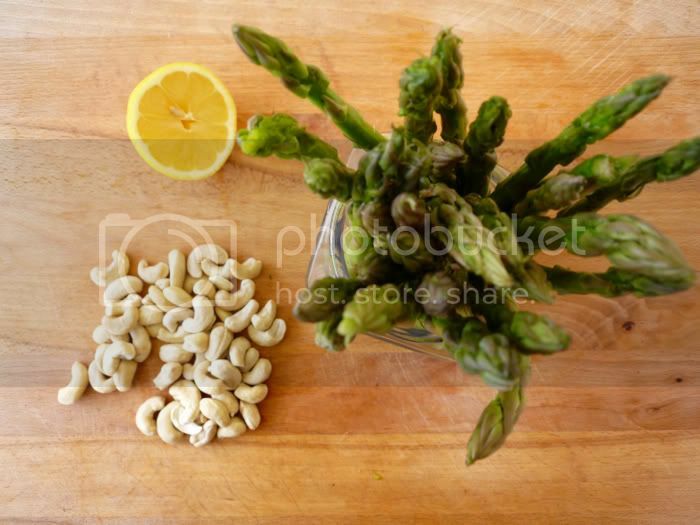 Cut the remaining asparagus spears into pieces and put them into a blender together with the cashews. Cover with water, blend until smooth, and add salt if desired. Slice the asparagus tips into smaller pieces. 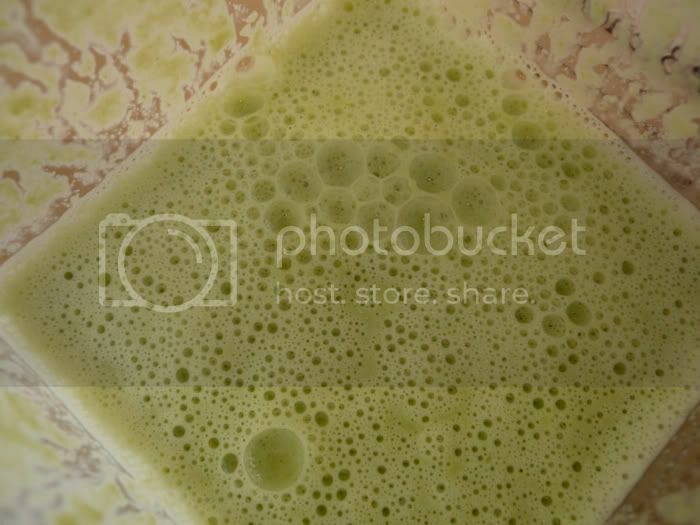 Stir them into the blended mixture along with lemon juice and noodles. When pomegranate is in season, you can sprinkle several kernels on top for an amazing contrast in colour and taste. Regular “raw,” or untoasted cashews that are sold in grocery stores are most often not raw. After harvest, nuts are put through a steaming process, which softens their hard outer shells. Apparently, only a couple of cashew producers use a technique that doesn’t involve high temperature steaming. Thus, if it’s important to you, look for “really raw cashews” which are available through various websites (although the reliability is often unclear, as there is a lack of regulations). Apologies for the recent lack of posts. We’re both busy as bees. We’ll be back up to regular programming in a bit. Where have you been? Oh, creating another wonderful dish. I would have never thought of it. 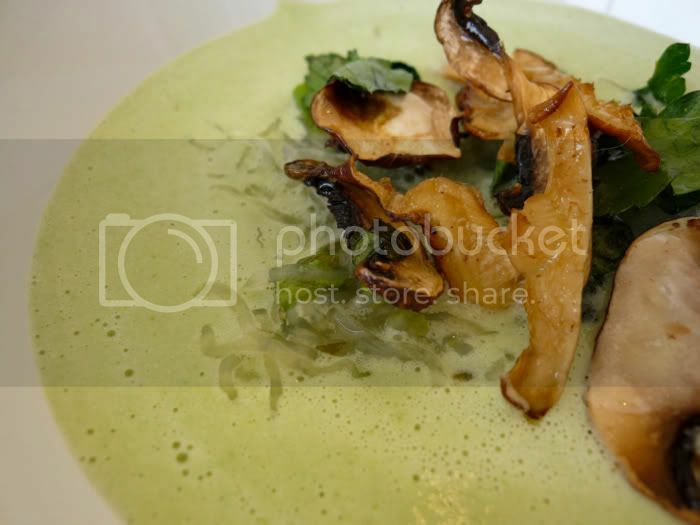 Looks amazing and the kelp noodles must be a great compliment to the soup. Can’t wait to see what’s next! Pam: Thank you & it is! 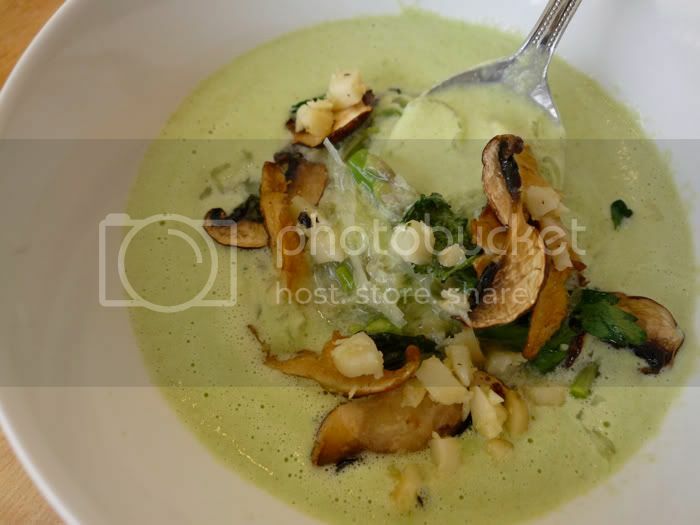 Happy Chef: We’ll be back up to regular posting quite soon & thank you! Amy: Hope you liked it! I’m in a asparagus frenzy right now. eating it served differently every day. Unfortunately I’m so behind in my blogging it will take a while of catching up before I post them. I keep seeing recipes for shaved raw asperagus with pecorino cheese, lemon and pepper. Such a versatile ingredient. Once again – beautiful recipe. How can we get the best runescape gold,through the internet or the players in the game? Can we Buy WOW Gold with cheap price or other ways else?